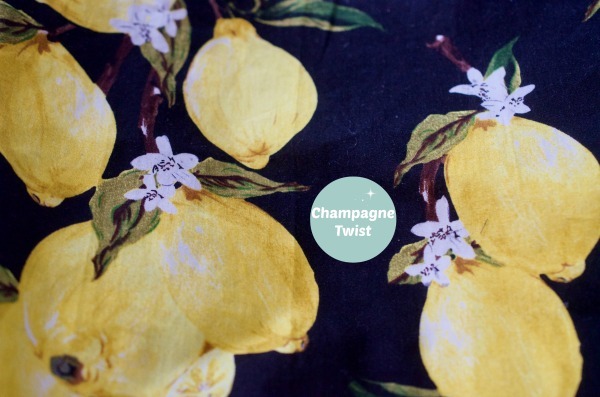 The dress that has featured on many a fashion blog is soon to be homaged. 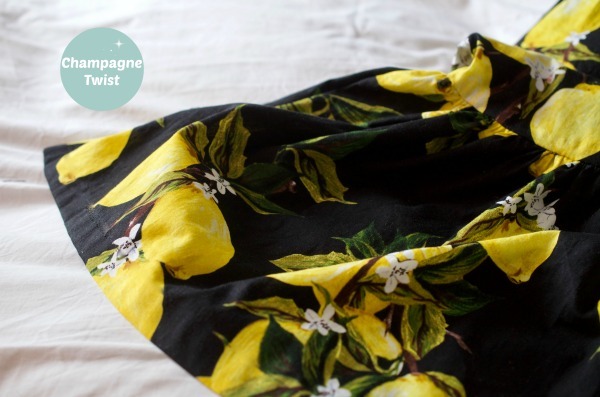 Using no less than 2 By Hand London patterns, I attempted to create a dress inspired by the D&G lemon print dress, at a fraction of the cost. 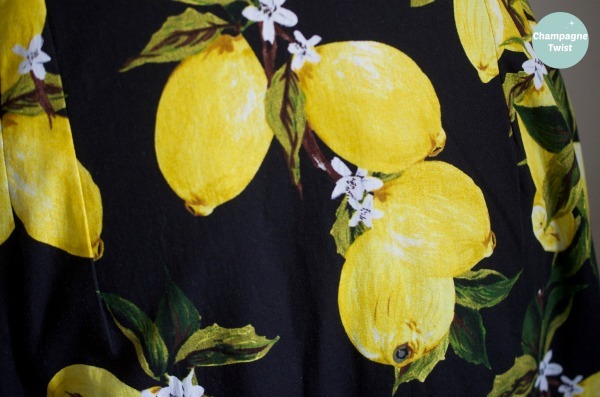 Dolce and Gabbana lemon print dress. The aim of this project is to prove that it’s possible to make a couture style wardrobe, without needing a millionaire’s budget. Check out the previous posts here, Post 1 and Post 2. 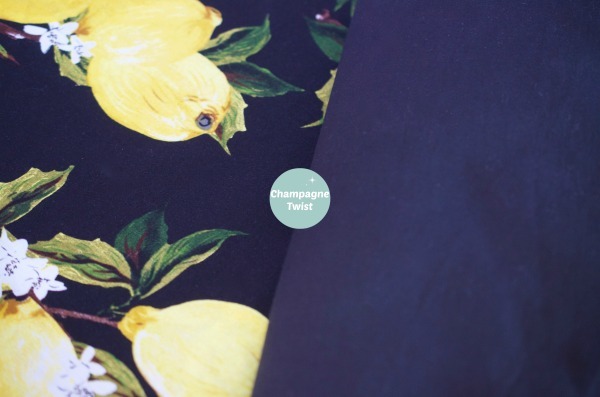 The choice was simple – the 100% cotton lemon print, on a black background, has been selling in several haberdasheries for months I purchased mine from Pigeon Wishes’ etsy shop at £7 a meter. I purchased 4 metres, but used less than 3. I also used a high cotton content mix lining from my stash, which was purchased at approximately £2.50 a meter, of which I used approx 2.5 metres. It is light weight with a lovely, soft feel. Notions used from my stash included a 40cm long invisible zip and 1 reel of black machine sewing thread. 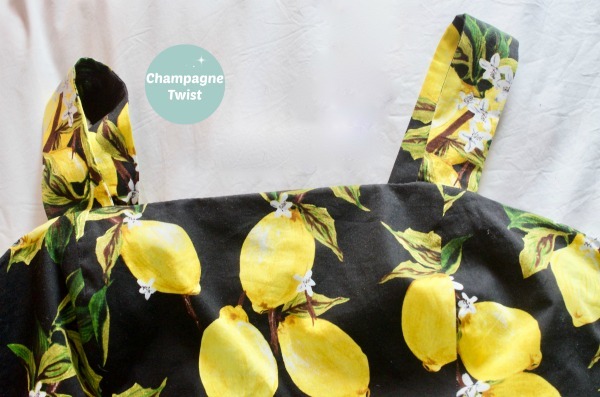 I hacked 2 By Hand Patterns – The bodice from the Charlie Dress, adding the Charlotte pencil skirt, with flounced hem. Cutting the main fabric was, thankfully, an uneventful process. Having previously made the Charlie dress bodice and drafted my own pencil skirt, cutting the pattern didn’t pose any issues. Unusually, I didn’t bother much about pattern matching, just ensured that the print didn’t cover or highlight things it shouldn’t! Like the Charlie dress, I lengthened the bodice by 5 cm. I excluded the decorative collar, to leave a plain neckline. I changed the skirt back zip opening to a left side opening, to match the bodice and for ease of wear. I cut the back skirt pattern on the fold, instead of cutting 2 separate pieces. It also resolved any need for pattern matching. The skirt was shortened by about 15 cm, to rest above the knee. This was for ease of walking and so I could attach the flounce. As the flounce is made from light weight cotton, it should have a nice movement as I walk. This is the only selection of the dress which will be unlined. Note to self, don’t sew when you’re tired. At one point the lining of the front bodice was attached to the back skirt lining. I like to add my own spin to my clothes, but even that for me would have been a little avant garde! Still, my unpicking skills are improving, and it now only takes me 2 minutes to rip out a seam. In effect the black lining became a silver one (worse pun ever). The main bodice was as easy to make as for the Poppy Dress. I changed my mind in regards to the elongated straps, opting for plain shoulder straps. I felt that the elongated bow straps added too much detail to an already busy piece. It would be also difficult to wear with a cardigan or other cover up in cooler temperatures. The Charlotte Skirt required a little more thought, as I changed the back zip to a side zip, and needed to ensure the waists of both the bodice and the skirt matched. I eliminated the skirt waistband, which meant the skirt waist was a few mm longer than the bodice waist. However, this extra fabric was easily absorbed into the seam allowance. One thing I did not anticipate when adding the side zip opening, due to the shape of the skirt, I can’t pull the dress over my head. Instead I have to step through the side opening in order to put the dress on. It’s no big deal, but it does take a little getting used to. 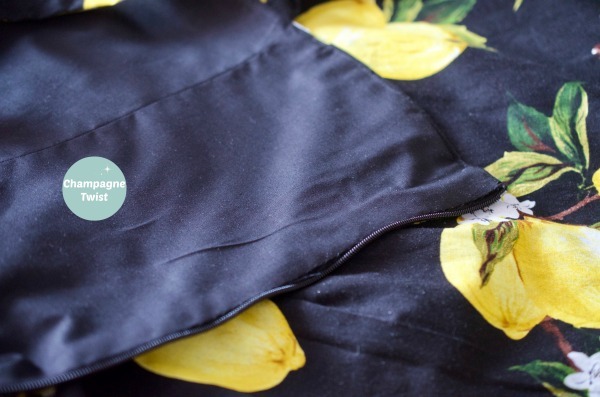 Adding the lining was simply a case of duplicating the patterns in lining fabric, then attaching to the main fabric from the neckline. I completed the dress by hand stitching the hem.